The Dodgers are finishing May by making a big move with the National League traveling championship. Hitting and pitching at a high level, the Dodgers are angling to become the third team this year to defend the title. 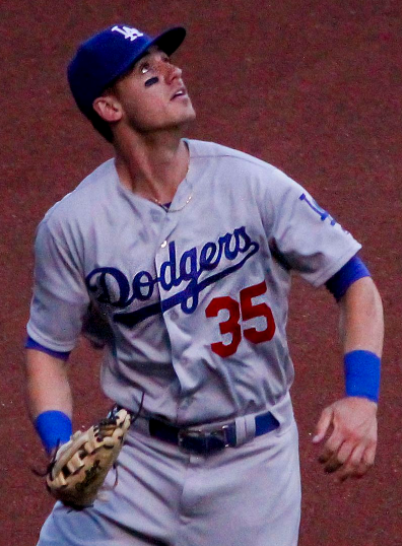 Cody Bellinger hit two homers for the Dodgers in a four-game stretch for the Dodgers while they played for the National League traveling championship (Johnmaxmena2/Creative Commons Attribution-Share Alike 4.0 International license). Closing out May, the Dodgers are playing their best baseball of the 2017 season. With five straight wins through May 29, the Dodgers aren't just winning. They are dominating. It happens that the last four of those victories coincide with the traveling championship across the National League. The Dodgers now hold the title for the second time this season. 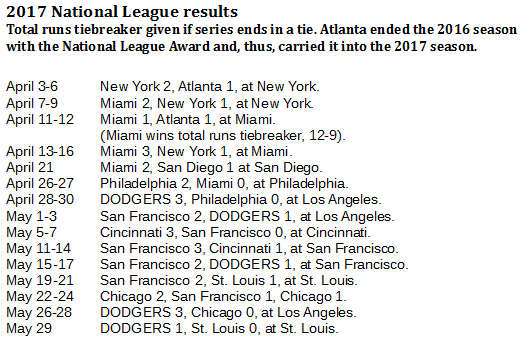 The Chicago Cubs arrived at Dodger Stadium with the NL traveling title on May 26, but it wasn't long before the Dodgers took it away. The Dodgers won three straight from the Cubs by a combined score of 18-4. The Dodgers began a four-game series in St. Louis on May 30 with a 5-1 win against the St. Louis Cardinals. Looking a little more closely at this four-game run by the Dodgers, we can see how sharp they've been against the defending World Champions and another club that has been a king in the NL for this entire century. In those four games, the Dodgers hit 10 home runs. Balance has been key. Chase Utley and Cody Bellinger were the only Dodgers with two homers in this small run, so six players hit the other six homers. As the composite batting numbers from the four games show (courtesy of baseball-reference.com), the Dodgers batted only .250. But 16 walks and 10 homers papers over a lot of batted-ball outs. They also paper over a lot of non-batted outs. The Dodgers struck out 41 times in these four games, the one disturbing trend across the team. On May 26, Dodgers left-hander Alex Wood pitched five shutout innings. He won, raising his mark to 6-0 and dropping his ERA to 1.69. Pedro Baez and Chris Hatcher each pitched two shutout relief innings to secure a 4-0 win. The next day, Brandon McCarthy pitched six shutout innings, improving his numbers to 5-1 and 3.28. Ross Stripling finished a 5-0 win against the Cubs with three shutout innings. On May 28, all of America anticipated a pitcher's duel between Clayton Kershaw of the Dodgers and Jon Lester of the Cubs. But Lester lasted not even four innings, and Kershaw hung around for barely more than that. Four Dodgers relievers combined for 4 2/3 hitless, shutout innings in a 9-4 Dodgers win. On to St. Louis. On May 29, Dodgers starter Rich Hill gave up one run in five innings. Four Dodgers relievers combined for four shutout innings in a 5-1 win for the Dodgers. The pitching numbers (from baseball-reference.com) are here, but one key set of numbers isn't. In these four games, the Dodgers produced 15 shutout relief innings. Long-term, the Dodgers won't hold up if four out of five starts last only five innings. Their batters can't be striking out 10 times per game, either. Short-term, though, the Dodgers rolled up key wins against strong competition. And dominated with the NL traveling championship. Famously, the Cardinals have owned the traveling championship in the NL since it launched in 2011. But the early indications in 2017 show that we could see different results. The Cardinals whiffed on their first try at the NL traveler when they lost two of three at home to the San Francisco Giants May 19-21. With their Monday loss to the Dodgers, the Cardinals lost four of their first five games with the NL traveler this season. The leading teams so far in 2017 are the Dodgers, the Giants and the Miami Marlins. The Marlins notched a title with three defenses in April. 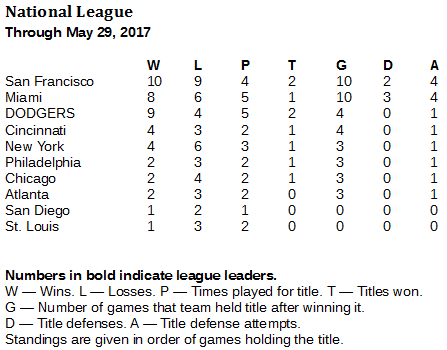 The Giants have a title with two defenses in May. The Dodgers, Giants, Marlins, Cubs, New York Mets, Philadelphia Phillies and Cincinnati Reds all have won titles this season. But the Marlins and Giants are the only clubs to successfully defend it. The Dodgers and Giants are the only clubs that have won it twice this season.